MHS collects stories that tell the history of Maine, connecting our future with our past, creating understanding between generations and between people of different backgrounds. We are so lucky to do this important work, which we cannot do without your support! As the year comes to a close, we hope you will consider supporting Maine Historical Society! Click here to support the Annual Fund. A wonderful new collection is available for researchers: The Walter Alphonsus, Jr. and Laura Mae Manchester O’Brien collection (Coll. 2962). Given to us by Julia O’Brien-Merrill, the daughter of Walter and Laura O’Brien, this collection contains the manuscript papers, business records, printed materials, FBI record, books, correspondence, photographs, genealogical research, newspaper articles, sound recordings, and several objects that tell the story of Walter and Laura O’Brien. Walter Alphonsus O’Brien, Jr. was born in 1914, the fourth child of Walter A. O’Brien from Portland and Susan Ann Crosby (born in Cambridgeport, Massachusetts and raised in Portland, Maine), who were both third generation Irish Americans. Walter had one brother, Francis Massey O’Brien (b. 1908) and three sisters, Mary Louise O’Brien O’Connor (b. 1910), Anna Kathleen O’Brien Gardenier (b. 1912), and Dorothy Elizabeth O’Brien Picard (b. 1921). Walter was raised in Portland Maine, graduated from Portland High School, and Gorham Normal School (later Gorham State Teachers College and today University of Southern Maine) at the age of 20. Instead of taking a teaching job, Walter went to sea in the mid-1930s performing various radio and communications jobs. It was while at sea that O’Brien discovered a taste and talent for politics and became a union organizer. In 1939, he married Laura Mae Manchester, who was born in Bridgton, Maine in 1920 but raised in Portland, Maine. Laura’s parents were Donald Baxter Manchester and Ethel Lillian Pendexter, both of longtime Maine families. Laura had two siblings, Melvin Lyle (b. 1921) and Juanita Ann Manchester (b. 1926); all graduating from Deering High School. Walter joined the Merchant Marines and served during World War II. After the war, the O’Briens moved to Boston and Walter took a position as port agent with the American Communications Association, a union affiliated with the Congress of Industrial Organizations (CIO). Walter and Laura plunged into politics in Boston and joined the Massachusetts Chapter of the Progressive Party (founded in Boston April 1948). The Progressive Party’s candidate for the 1948 presidential election was Henry A. Wallace of Iowa. He was an inventor and publisher who had served as FDR’s Secretary of Agriculture and Secretary of Commerce. Walter A. O’Brien was drafted as a 1948 Congressional candidate from both the Progressive Party and the Democratic Party in Massachusetts. O’Brien ran against Christian Herter, a Republican incumbent and future governor of Massachusetts. The O’Briens worked tirelessly to elect Wallace however he received less than 2% of the Massachusetts vote and only 2.4% of the national vote. O’Brien fared better than Wallace, capitalizing on his Irish surname and the fact that he also ran on the combined Democratic and Progressive Parties ticket; however, he lost to Herter by a 2 to 1 margin. In 1949, Walter O’Brien ran for mayor of Boston on the platform that the Boston Metropolitan Transit Authority (MTA) not raise their rates to bail out stockholders of the privately-owned transit company. Campaign slogans and songs were popular then, and O’Brien partnered with The Boston Peoples Artists, also like-minded Progressives, and the M.T.A. song was written after the current mayor increased the MTA fares by 50%. Public outrage followed and the M.T.A. song was a big hit and campaign boost to O’Brien. O’Brien lost the Boston Mayoral race to John B. Hynes, finishing last with barely 1% of the vote. Laura O’Brien, also active in the Progressive Party, ran for Boston City Council in 1951. Both remained Progressive Party members who were passionate about their political candidates. Despite the demise of the Progressive Party in Massachusetts and nationally in the early 1950s, the O’Brien’s continued to pursue their liberal ideology. The 1950s fostered in an era of the “Red Scare” and nationally the House Committee on Un-American Activities, led by Joseph McCarthy from Wisconsin, was “going strong,” blacklisting Hollywood actors, screenwriters and directors and working to execute the Rosenbergs. Massachusetts had its own Commission of Communism and this committee held more than 50 public hearings and private executive sessions calling scores of witnesses to testify. Both Walter and Laura O’Brien, along with their good friend Florence Hope Luscomb, all three members of the Progressive Party, were questioned by this Commission and refused to answer sensitive questions. As a result, 85 people in Massachusetts were named “Communists or followers of the Communist Party Line” in an official published report. The O’Briens, with many others, rejected this report and vowed to “continue to fight for the rights of labor and civil liberties” guaranteed in the United States Constitution. McCarthyism in the 1950s resulted in the O’Briens being followed by the FBI and essentially blacklisted by the Commission. Unable to get jobs, Walter and Laura O’Brien and their two children, Julia Massey O’Brien and Kathleen Manchester O’Brien, moved to Gray, Maine in 1956, together with Laura’s sister Juanita and her husband Chuck Wojchowski and their two young children Rachel and Don. In 1960, they all settled in Portland, Maine and lived there for ten years. Walter sold cars and then became a librarian while Laura, at the age of 37, started college and completed a teaching degree at Gorham State College. She went on to obtain a graduate degree in the mid-1960s and became a Reading Specialist in the Gray public schools. Walter and Laura had a third daughter, Amy Pendexter O’Brien, born in 1964. In the late 1950s the Kingston Trio discovered the M.T.A. song that Walter’s campaign had used, changed some wording, and released their own version on their second album in June 1959. The Kingston Trio dropped the name Walter A. O’Brien and replaced it with George O’Brien. The song became a hit and for a time Walter and Laura were thrown into the spotlight. Walter enjoyed this attention; Laura, not so much. In the 1960s, Walter pursued his Master’s Degree and became prominent on the State of Maine Library Commission for a number of years. He served as librarian for Lewiston Public Library, University of Southern Maine Library, and Westbrook High School Library. In retirement, from 1980 to 1990, Walter and Laura owned a small bookstore in Cundys Harbor, Maine, called “The Book Peddlers.” The business, also called “Parnassus on Wheels,” was open “only in the summer, by chance.” Walter specialized in Maine books and Laura in children’s books. Walter A. O’Brien died in Maine in 1998 at the age of 83. Laura died two years later at the age of 79. Both died in Cundys Harbor, Maine. The Walter A. Jr. and Laura M. O’Brien Collection contains limited information about Walter’s brother, Francis M. O’Brien, who in his own right was known for his love of books and his Antiquarian Bookstores in the Portland area. The collection also contains information about Florence Hope Luscomb, a close friend of Walter and Laura O’Brien. Florence was a fellow member of the Progressive Party; was one of the first women graduates of MIT in 1909 and a lifelong activist for women’s rights, civil rights, labor rights and civil liberties. In 1998, with the help of Walter and Laura O’Brien, Florence Luscomb was honored by the Massachusetts Commission on the Status of Women. A bust of Florence Luscomb, along with other prominent women in Massachusetts history, now hangs in the State House honoring their many and varied contributions. In 2017, Julia M. O’Brien-Merrill, Walter and Laura’s middle daughter, honored her father’s legacy by writing and publishing a children’s book entitled Charlie on the M.T.A. Did He Ever Return? The book, published by Applewood Books, Commonwealth Editions, in Carlisle, Massachusetts, includes actual historical facts and a timeline in addition to the lyrics of the original campaign song. It is illustrated by Caitlin Marquis. The book is included in the collection. We are thrilled to have this collection here at Maine Historical Society, and especially delighted that Julia O’Brien will be sharing her children’s book with us on November 11th! 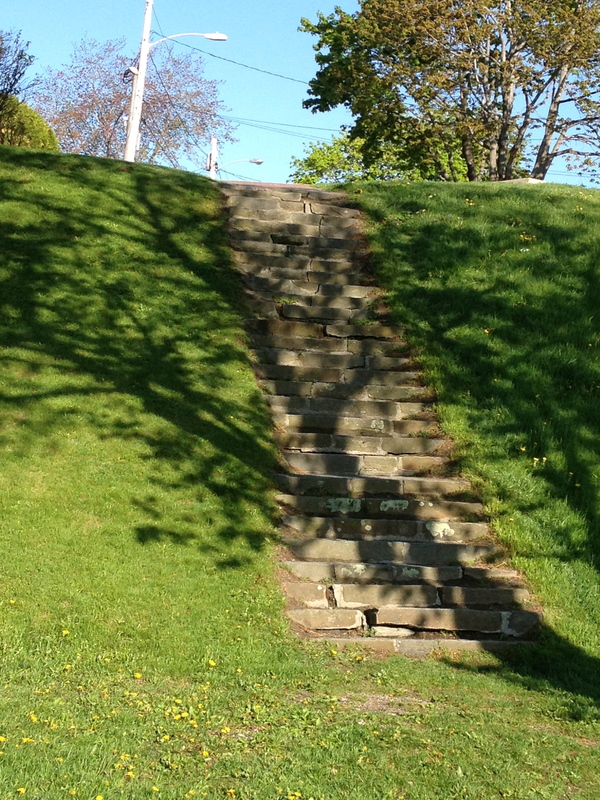 The early morning sunlight freshened over Back Cove onto Baxter Boulevard as I walked along it in mid-May, 2013. Back Cove is the large salt-water inlet in the middle of Portland, Maine, sometimes called Back Bay, rimmed by a three and a half-mile recreational trail. The Boulevard hugs the trail for one and one-half miles on its western side and until May 2007 was part of U.S. Route 1. In good weather my husband and I walk daily. We fall out of our third floor apartment to the Boulevard before breakfast and hoof the trail to and fro. Sometimes we walk together, sometimes separately. For a series of May mornings in 2013, I walked alone. It was the sixth month of the Boulevard’s closure to vehicular traffic because of a large federally mandated wastewater project. Cyclists, runners, and we walkers had been enjoying the road closure to no end. In fact, it led to an ad hoc petition to the city, to close this part of the Boulevard every Sunday afternoon from May to October after the construction was finished so the public from all around could use it as we had. The City Council approved the move, and now we have our own little “Sunday Afternoon on the Island of La Grande Jatte,” like the painting by George Seurat. The morning I snapped to and did what I had been thinking of for many days was like all the others, basking in the beauty of the path of old linden trees, the view of the city on its hill, and the special peacefulness as I swung my arms and headed home. I had taken to walking in the middle of the Boulevard without traffic, except occasional trucks with sand or stones and machinery on tractor-trailers. 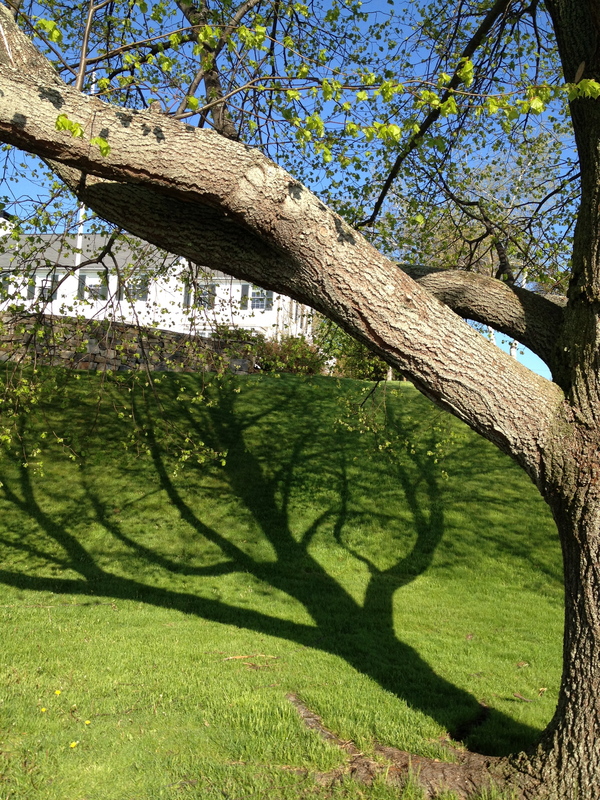 Gradually I paid more attention to the tree shadows on the embankments. 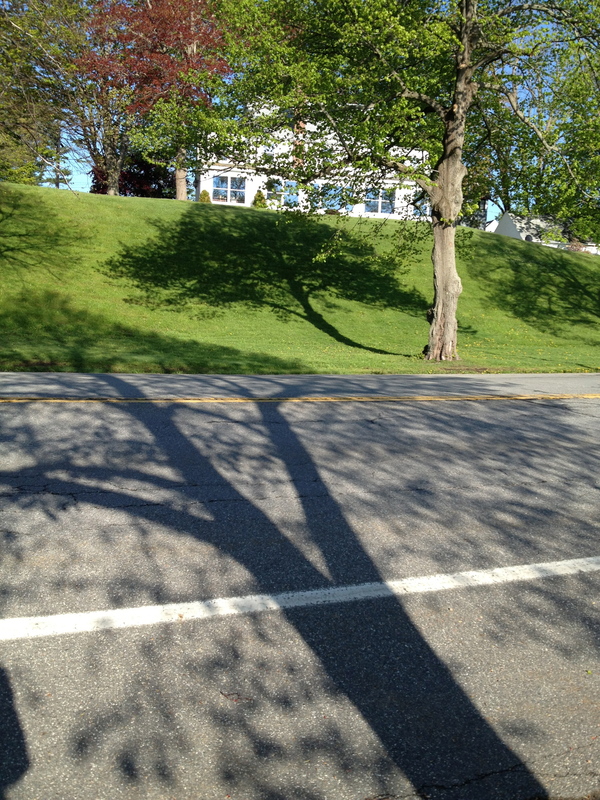 Without the hillsides topped by Boulevard houses there would be no “standing” shadows. Wouldn’t they make good pictures? I thought those mornings. But who would care? “I care, “ must have been the answer to my interior dialogue that morning, because I pulled out my cell phone and took the first of 50 or so photographs, half that day, moving south; half the next day, moving north. My impulse to start photographing almost exactly half way in the half mile of ideal embankments, backdrops for the shadows, was a surge of living in the moment. If not now, when? If not me, who? I stood in the Boulevard roadway (something no one could have done for any length of time before the closure) with the rising sun behind me and only the shadows in my camera lens. The trees were just beginning to leaf out so their trunks and limbs were perfectly etched against the Irish green hillsides. 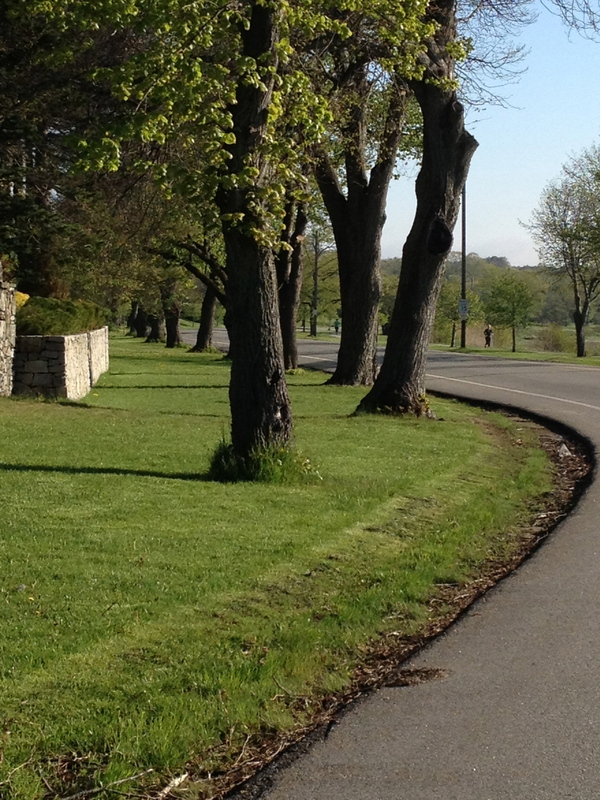 Lindens are not the only variety that flank the Boulevard roadway like silent sentries. Some are maple or birch. I photographed only the trees on the hilly westerly side of the Boulevard between Dartmouth Street and almost to Chevrus High School. 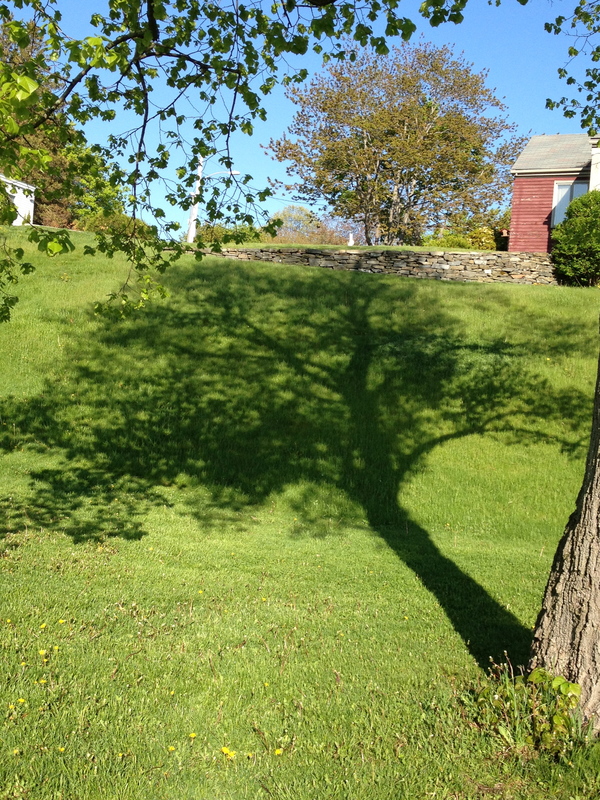 The criteria were that the shadows had to “stand up,” which required a hillside behind them. None of this was calculated on my part. I was just documenting images –- a place in time — when one could linger and look because there was no traffic. I thought in the future an arborist or Olmsted devotee might take my little album with them as they checked on the historic trees’ development. After all, it had been nearly 100 years since many, if not most, had been planted. “How do Portland’s tree gardens grow?” one might ask in 20 years. The European linden trees were first planted on nearby Forest Avenue, Memorial Day, 1920, and then transplanted along with others the next Memorial Day to honor Portland’s veterans who died in World War I. Each tree is dedicated to an individual. There is a little quarter-sized metal tag with a number corresponding to the veteran’s name struck into each linden tree at varying heights, on the oldest trees now slightly above where if one were installing them they would be hammered in at eye level. The history of these trees is fraught with meaning and memory, not only for the veterans’ families but for everyone. They stand as tributes to men who fought in good faith in the First World War, the one to end all wars. 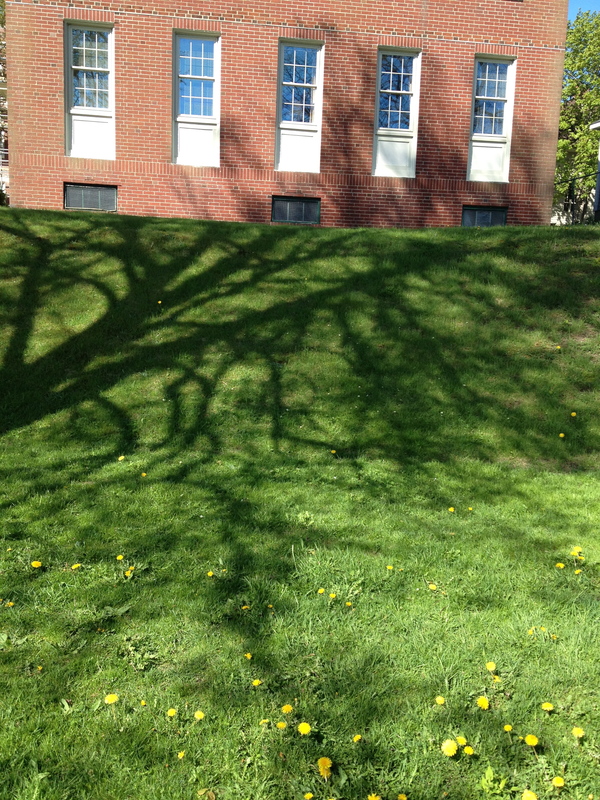 Peace, or peace education, is frequently on my mind, and the linden trees are friends to the cause. James Phinney Baxter, several times Mayor of Portland in the late 1800s and early 1900s, had the vision of linked parks for the city, including the creation of the Back Cove Park we have now. The Cove was grossly polluted and stinky from toxic, industrial run-off. Portland had the same sanitation and health issues as Boston, with its swamped Back Bay Fens and rivers oozing into the Charles River tidal basin. Baxter visited Boston and the renowned landscape designer Frederick Law Olmsted who created green spaces for urban dwellers in many places and a long-term solution for Boston. Olmsted put his son, John Charles Olmsted, and Charles Eliot onto the task of studying what would work in Portland, both to solve the functional problems and eventually to attract a stronger tax base of residences and businesses. It would be twenty years for Baxter’s vision to take root because of politics: when elected he led on the idea; when not in office the plan was shelved. “All’s well that ends well,” however. Many people with expertise and hard work created the Boulevard, shored up the Cove, planted the memorial trees, made a recreational path, and, finally, a posthumous naming of Back Cove Boulevard in the memory of the man who saw its possibilities: Baxter Boulevard, indeed. 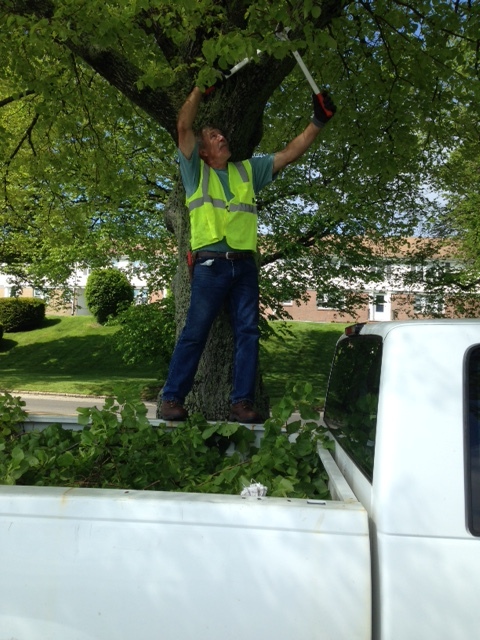 Thor Nilsen of the city’s Parks & Recreation Department cares for linden trees along Baxter Boulevard in 2017. Nilsen first tended to these trees 50 years ago as a college student. In 2009, the City of Portland estimated that 250,000 people used the Boulevard’s recreational trail. That number does not begin to reflect how many vehicles drive along the road. One does not have to be a commuter to enjoy the Boulevard. There is a host of cars carrying plain, old-fashioned people who appreciate beauty and a magnificent view. My maternal grandmother, a Vermonter born in 1874, came to Maine the last few summers of her life when she was widowed. She and my aunt, Gramma’s oldest child of her eight children, divided their year between Southeastern Vermont in the winter and Bowdoinham, Maine in the summer, both areas where my aunt was employed. What Gramma liked best in Maine was Baxter Boulevard. On a summer’s day-off in the late 1940s and early 1950s my aunt would drive her to see the Boulevard. I imagine they stopped at the brick bridge with built-in seats and outgoing water rushing beneath them. Since Gramma had lived through two World Wars, the deaths of three of her children, and my mother’s debilitating illness, I also imagine she appreciated the meaning of the growing, thriving linden trees. The linden trees offer beauty with their white flowers, scented essence and busy bees in early summer. Why were lindens chosen? At least two theories have surfaced over the years: linden trees grew all over France and the French people paid dearly with their lives in WWI; and, the Baxter Boulevard designers wished to copy the Unter den Linden in Berlin, a famous city park of the time. After the linden trees were first planted, veterans looked after replacing them when needed. Now, the trees suffer from automobiles crashing into them, diseases, and for the young ones a mowing too close to the bark and roots like shaving a man’s face by the lips or ears. It appears that more trees on the eastern side of the Boulevard, next to the trail, are either damaged, need care or replacement, or are replaced. I might think that, because I walk on the trail and not the road. 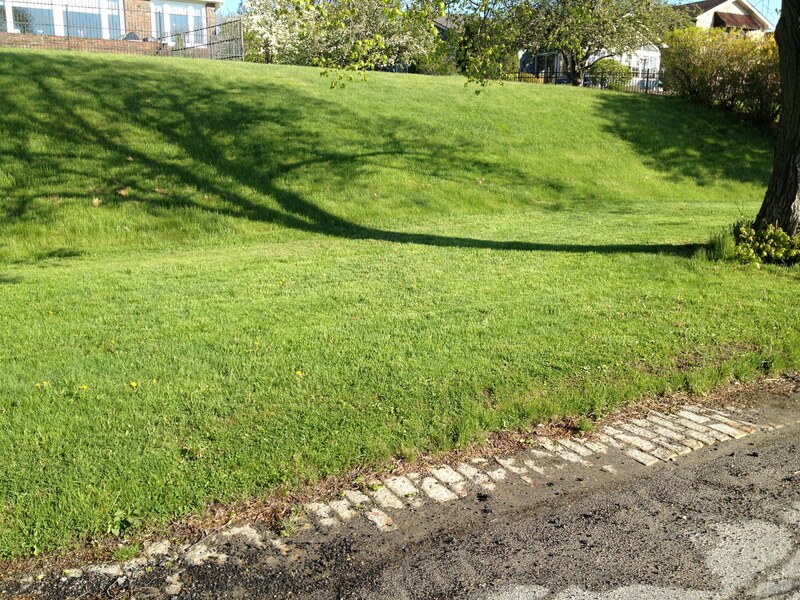 That is why I took the photographs May 13 and 14, 2013: The road was there for the standing, the early morning sunshine was a gigantic search-light, and the city engineers and designers had chosen to build an embankment, or used an already existing hillside, as a fertile green backdrop for the memorial shadows a century later as we remember the Veterans of WWI.